Thou Shal Wear Plastic Glasses | Hipsters and Hassids: The painting series. The phenomenon. The first point of irony is that this message to hold to strict traditions is projected on twitter. Twitter. 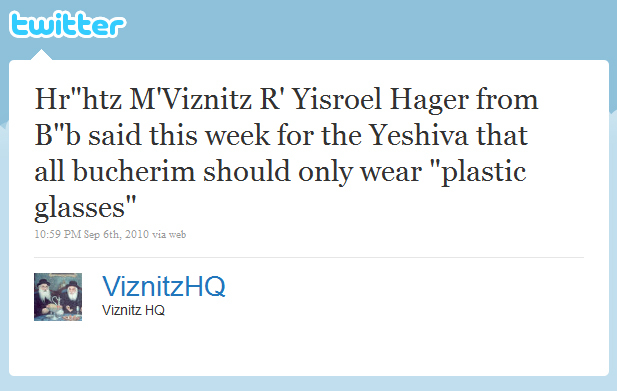 From a Hassidic source in the Viznitz would. Twitter is very commonly known for being a tool for hipsters to project their missions and serve their initiatives. So how did tweeting this message become acceptable, but picking up a pair of specs is not? As for the message itself, the point of wearing plastic frames is to not fit in too much with the other nations and modern mainstream culture, aka nonsense. The irony is that the quinticential hipster look is to wear large plastic lenses, very much similar to what is considered traditional in the Hassidic world. The irony of ironies, and what makes this situation a real subject for Hipsters and Hassids, is that as much as these two groups are trying to be unique and separate themselves from mainstream culture, the more they are acting like each other. Rabbi Hagar said, “a student who wishes to delve into Torah studies and observe mitzvot must detach himself from all nonsense and not let them infiltrate.” Back you dirty artists! Back I say!